"I for one tried to take the injunction to love myself to heart, and I really devoted myself, but I found I needed to keep my relationship with myself open so that if things didn't work out I was free to see other people." Minyan is a book about ten Jewish men told through the eyes of Norbert Wilner who helpfully tells us, "although parts of my story are identical to the author's, I am a fictitious character." "Funny, good writing and interesting characters, but lacks narrative thrust, doesn't hold up as a novel." Although in stating Minyan's main flaw, its lack of narrative thrust, Eliezer seems to be saying, You think I care? It's a good book, read it and laugh a little. The result then of these stories strung together with no narrative thrust? Brilliant. This book is amazing. It has a heart to it and a delight that pours out. For me the true test of a great book isn't the narrative thrust, i.e. a story that keeps you turning the page, but an emotional thrust: I turn the pages because I care, because the book delights me and connects with me; it has a heart and soul. Minyan is all this and if you want a comparison, then think Kurt Vonnegut and think of one of those films made by a small film company that lacks drive and a neat ending, but charms the hell out of you without assuming you're a moron. The book is insightful, layered and funny. And thankfully it doesn't try to preach a message to the reader. O and there is some narrative thrust. Wilner decides to start the Happy Hearse Funeral Parlor, discovers salvation through humour and falls in love. "Why, you thought I was all talk?" "37-yr-old Jewish gypsy bohemian fringe artist type, sad, fearful, incapable of intimacy or commitment, no real job or future, moderate substance abuser, seeks wealthy Jewish blonde virgin who will mostly leave me alone and bear me children." "Other people have mystical experiences in which they hear prophetic voices inside their heads; Wissbaum hears only "Beer here! Get your ice cold beer here." Eliezer's writing style is excellent and he uses the phrase "See him there ... " in much the same way that Kurt Vonnegut uses the phrase "So it goes." In fact you do get the distinct impression as you read Minyan that Eliezer Sobel perhaps has a flash of genius about him. See him there now laughing at this remark. Hopefully see him there writing as well - I want more. 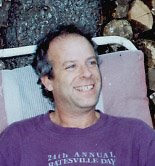 Eliezer Sobel is the author of Wild Heart Dancing. He lives in Batesville, Viginia. Minyan was the winner of the Peter Taylor Prize for the Novel. Visit Eliezer Sobel's site here. Mike, such a wonderful review: it sounds like a book I shouldn't miss and won't be able to put down. How you chose them mystifies me--but I'm so grateful you do. 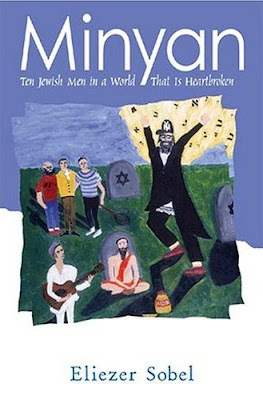 "Ten Jewish Men in a World That is Heartbroken" is published by The University of Tennessee Press? To US writers--and I would hope readers worldwide--that alone indicates a rare and invaluable find. He found me Kathleen through the GO!Smell the Flowers web site and sent me the book - to my shame it took me ages to get around to reading it! Great it came to this Mike and that people can connect online and convert it to a more touchy feely relationship from book to handshake! Review reads really well, thanks for sharing. Hey Mike! I just discovered this by accident--didn't know you reviewed it--thanks so much, I always felt that the book got overlooked for the most part (along with most of the other 400,000 books published that year) but it remains very gratifying to know there are at least a few appreciative readers out there. No probs and thanks for a great read Eliezer!